We invite you to download our New Cancer Patient Resource Guide. Appointments: To schedule a first-time appointment for most types of cancer, please call 919.668.6688. To shedule a first-time appointment with Hematologic Malignanices / Blood & Marrow Transplant, please call 919.684.8964. To reschedule a missed appointment, please call 919.668.6688. 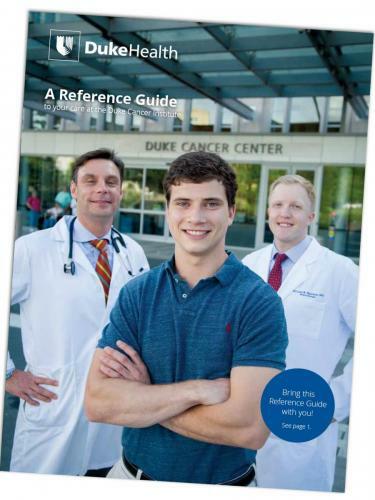 Duke Cancer Centers: To reach one of our locations, visit dukecancerinstitute.org/locations. To reach the Duke Cancer Center Durham front desk, please call 919.684.2410. Oncology Triage Line: If you are a Duke cancer patient and need health advice or medical support, our oncology triage phone services are available Monday through Friday, from 8 a.m. to 5 p.m. To speak with a Duke oncology nurse, call 919.668.6608. For oncology triage support for Hematologic Malignanices / Blood & Marrow Transplant, please call 919.684.8964. Cancer Patient Support Services: Our Supportive Care and Survivorship Center offers programs and services supporting patients and their loved ones. For more information, call 919.684.4497. Medical advice and appointments cannot be given through e-mail. in Durham and Wake County, please visit Locations. To subscribe to the bi-weekly faculty and staff eNewsletter or for other DCI communications-related inquiries, please contact Karen E. Butler, Director of Communications, Duke Cancer Institute, at 919.684.3752. Media, please call 919.684.4148 or visit Duke Medicine News and Communications.